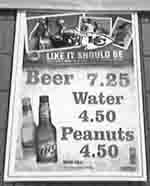 On August 17, 2007, I labored on behalf of Habitat working at a concession stand at Arrowhead Stadium during a Chiefs' game, at which beer cost $7.25 per bottle. The ten of us volunteers arrived at 3:00 pm for a 7:00 game, and we worked really hard from then till 11:00, with nowhere to sit down and no time to sit there anyway. At 3:01 some guy named Mike, wearing a chef's coat and talking incessantly into a walkie-talkie, flew in and asked, "Who wants to cook?" I raised my hand and he said, "See this list? Get this many of these items out to the front as soon as possible." Ten spicy chicken sandwiches, five hamburgers, and 30 cheeseburgers. He picks up a three-gallon pail of oil and sloshes an obscene amount onto this huge, hot griddle. From then on the amount of time Mike spent explaining how to perform all the dozens of various tasks expected of us ran to less than five minutes, spread out among several dashes into stand #305 of a few seconds each. Seriously. We were expected to somehow figure out almost everything else, and pretty damn fast! In addition to performing most of the grilling duties I also prepared fries, soft pretzels, and various hot dogs and brats, which is everything that's made in the kitchen. And everything you make you also have to wrap and then distribute out front. And you have to somehow guess how much of any item will be needed well ahead of time. Fries take five minutes from start to finish, burgers more like ten, and chicken more like 15. I toss 35 burger patties and ten chicken patties onto the grill, track down the cheese, track down the buns, and start flipping burgers. I am Mel in "Alice," and I am loving it. Here is the extent of the directions for how I am to cook. "Toss some Lawry's on the burgers and the chicken. Toss the chicken in Frank's hot sauce, and toss some Lawry's into the fries." Notice that these directions address only the subject of what to do after something is cooked, not how actually to cook it. In my defense, I did tell Mike that I was only willing, not necessarily able, to cook. Notice also that no instructions were given as to cleanliness. I washed my hands before I grabbed the first box of burger patties, and I tried to wash my hands every so often thereafter, and I tried off and on wearing gloves, but the fact is there simply was not enough time to keep the food as clean as you the eater would like it to be. Does your pretzel taste a bit like Frank's hot sauce? That's because I wore the same right glove for ten minutes straight, during which time I touched not only the hot sauce but also all sorts of nasty things you wouldn't want on your food. I had to change gloves pretty often, at least in the kitchen, because after a while sweat starts dripping out. Do your fries taste a little bit like the handle of the freezer, or maybe the barrel of garbage I had to move out of the way to get to the tub of Lawry's? Now you know why. Above and to the left of the grill was some sort of drainage tray just outside the walk-in freezer, and it constantly dripped water through a really yucky-looking, crud-encrusted grate, much of which ended up on the floor. We never got a straight answer as to what it was, but I can tell you that some of that splashed run-off is right now coursing through the bloodstreams of certain people who ate certain spicy chicken sandwiches at a certain concession stand at a certain football game yesterday. At one point an hour or so into the game this Habitat guy Craig and I were standing in a breezeway looking out over the stadium, and he says, "I can just see the headline: 'Chiefs Lose Game, Fans Lose Lunch.'" As it turns out, everyone who had a comment about the cheeseburgers liked them, including me, but I can still see a few of those early ones in my mind, and they weren't my best work. And I can see a few I wouldn't feed to PheyeG'hdeaux (our dog). Anyway, it was a terrific experience, if a bit harrying at times. I think it would be a tough job even for an experienced crew to do all this all on time to the customers' satisfaction and with the least waste (and the fewest food-borne illnesses), but for us utter novices it was 50% figuring out what to do, which left only 50% of what we needed 100% of the time to do. Except for this one somewhat demanding volunteer who wanted everything done exactly her way and right away (we soon learned to ignore her and she somewhat less soon learned to shut up), we worked together in a gratifying way. In such rushed and chaotic circumstances, at least the way Stand #305 is organized, it is vital that every volunteer work hard at working with every other volunteer. Whether you're working in the kitchen or out front selling, it's rare for more than a minute to go by when you don't need something from someone or someone needs something from you. Most of us in our group of ten were strangers to others and some of us were strangers to most of the others before the night began, but not so by the end of the night. This is a bonding experience, sort of like what soldiers go through in extended combat (except that the worst you can expect in stand #305 is getting grease spattered on you or yelled at by a righteously disgruntled customer). If you can't accommodate and cooperate, the system drags and everyone suffers. The group I worked with got along in such a way that made me feel good to observe. It's true our initial efforts were aimless due to lack of experience and training, but we never stopped trying to focus and we never stopped trusting one another and treating one another well. As a result the mosh pit we started with tightened up into a ballet. We lost 10-11. If an utter lack of experience hampered us, the infrastructure of the stand itself did so more. As the designated grill man I was hampered from the start by having no spatula, and I never did get the promised grill scraper. The spatula I was eventually given was too flimsy to "skin the grill," so a lot of people ate parts of the cremains from dogs and burgers and chicken from hours before. It was at least 90 degrees in the kitchen, and obviously a lot hotter when you're slaving over a ginormous grill. I drank perhaps 20 cups of ice water in eight hours, and I never once needed to return any of it, if you catch my drift. I was surprised to discover that when you're standing over that grill, the heat is so intense you never do drip sweat onto it. The reason is that the perpetual wall of heat it gives off evaporates the sweat before it can bead up and drip, which Martha Stewart would probably agree is a good thing. I did learn that you have to keep slathering oil onto that huge slab of hot steel. If you let it get dry, stuff starts to stick, but if you keep the food swimming in it then everything cooks faster. Oddly, the oil is white in the container, but it turns clear the instant it hits the grill. And I now know that as between cooking fast and saving money on oil, oil is really cheap in the carton, although I'm not sure how cheap it is in the long run in people's veins. Another problem was that the cash registers in the entire stadium were broken. Another problem was that every beer tap in our stand gave out only warm foam, which we learned our cold-beer customers are unwilling to pay $6 a cup for. You understand, there was a water fountain not a minute away, with a much quicker line. And for that matter, if she had paid us just $3.00 for a soda pop cup, we would have kept it filled for her with ice and water all night. Maybe she is really wealthy or she owns stock in Aquafina. Update of September 19, 2007: According to someone on NPR this morning, the rate at which plastic water bottles are discarded is 2.5 million per hour. If it takes you ten seconds to read this paragraph then in that same time another 7,000 bottles were discarded. Read it again. And it takes a fair amount of petroleum and air pollution to produce and package and ship so many bottles, nearly 22 billion a year according to my math. Dentists and other scientists figured out a few decades ago that bathing teeth in fluoride prevents what was at one time in the 20th century the single most prevalent disease in the world, dental caries, better known as cavities. Untreated cavities lead to infection and eventual loss of the affected teeth, which is why you see so many old people wearing dentures but not so many younger ones; the old people did not have the advantage of growing up drinking fluoridated water. So why has the incidence of dental caries increased in recent years? One explanation is the lack of fluoride in what is nowadays so many kids' principal source of drinking water. The water district where I live charges $2.81 per 1,000 gallons of tap water, but to be conservative let's round that up to $3.00. You may do the rest of the math if you like, but according to mine that 16-ounce bottle of water cost that woman 120,000 times what tap water costs. At that price it's 13 times more expensive than gasoline. Bottled water fills up landfills faster, it pollutes, it rots your teeth, and it is crazy expensive. I still do not understand why people buy bottled water. As I say, it was an interesting eight-hour shift, and I'm glad I experienced it. I plan to do so again.